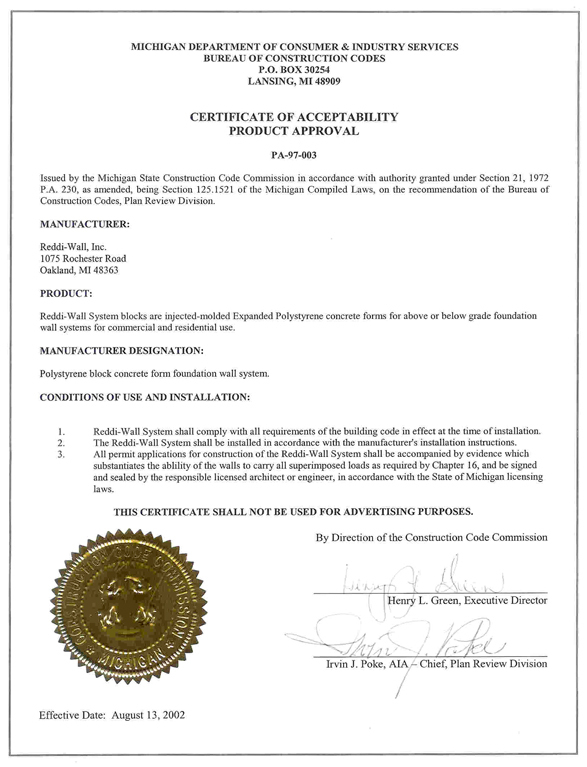 See our Certificate of Acceptability Product Approval: Issued by the Michigan State Construction Code Commission. See our Certificate of Acceptability Product Approval: Issued by the State of Wisconsin, Safety & Buildings Division. The manual includes the building procedures, detailed figures to help with the building process, a building checklist, and other forms that you may need. This pdf document contains vital information. Consumer brochure highlighting the Benefits and Features of ICF vs. conventional poured walls. A must read for anyone considering ICF wall systems. The most frequently asked questions regarding our products and services. Reddi-Wall ICF Systems vs. the competition. Quick profile of the benefits of Reddi-Wall ICF. Charts and graphs of test results for "Main Floor Ambient Air Samples" and "Basement Air Samples"
Future Benefit: Gas Study I. 2600 Square Foot Raised Ranch Home with walk out basement. Basement and above grade exterior walls are built with the Reddi-Wall foam insulated concrete wall system. Serviced with natural gas. Heated by a natural gas forced air furnace. Natural gas stove, hot water heater, and clothes dryer. Download Future Benefit: Gas Study I. Future Benefit: Gas Study II. This home has a Reddi-Wall walkout basement with one inch of foam insulation under the basement floor. The first and second floor walls are R-13. The ceiling on the second floor contains R-19 blown-in insulation. Download Future Benefit: Gas Study II. The PDF format allows you to view forms, books, and other documents electronically on most any computer the way the author wanted it to look. The freely available Adobe Acrobat reader is required to view and print PDF files. Click below to get Adobe Acrobat Reader.